“Phantom of the Opera” is the longest-running production in Broadway history. The other day, the musical celebrated its 30th anniversary with a gala. The original cast was honored at curtain call, sharing the stage with current actors. Among those taking a well-deserved bow: original company member Dodie Pettit. It was a bittersweet moment. The longtime Westporter met her husband, Kevin Gray, during the show. He was the youngest actor to play the title role. Gray — a 1976 Staples High School graduate, who learned his craft with Staples Players — died in 2013 of a heart attack. He was just 55. Dodie Pettit, at the 30th anniversary gala. Two years later, Pettit produced a tribute CD. 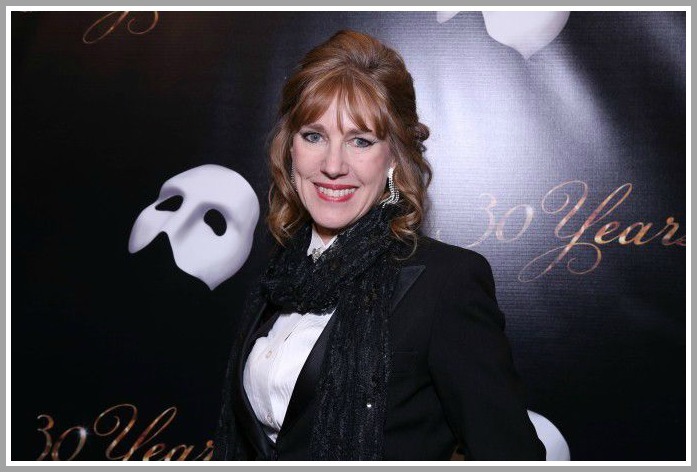 She gathered over 170 Broadway singers, including 10 from the “Phantom” cast. Each had a personal connection to Kevin and Dodie. Westport was well represented on the CD, by Terry Eldh, Adam Riegler, Paul McKibbins, and of course Pettit. All proceeds go to scholarships in Kevin’s name, at his alma mater Duke University, and the University of Hartford’s Hartt School, where he taught (and where the Kevin Gray Foundation was organized by Westporters Peter Byrne and Jamie Wisser). Pettit made sure to mention the CD, during gala interviews. After all, he was an integral part of the show’s amazing history. And if “Phantom” runs 30 more years, Pettit will make sure that Kevin Gray is remembered then too. The “Kevin Gray: Forever Always” CD is available for sale on iTunes, Amazon and by clicking here. This entry was posted in Arts, Entertainment, Staples HS and tagged "Phantom of the Opera", Dodie Pettit, Kevin Gray. Bookmark the permalink. Terry Eldh, another Staples grad starred in the role of Carlotta. She was divine!